This past Saturday night before a sold-out crowd at the Franklin Theatre near Nashville, country music legend Larry Gatlin was honored on-stage when he was presented with two BMI "Million-Air" Awards. The honor is given to songwriters, composers and publishers whose songs accumulate over one million U.S. broadcast performances. 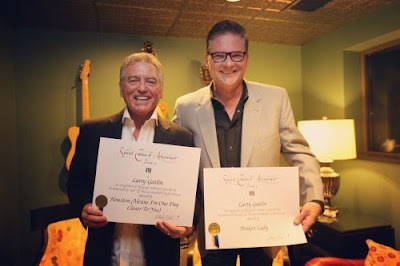 BMI's Perry Howard was on-hand to present Gatlin with awards for his self-penned hits, "Houston (Means I'm One Day Closer to You)" and "Broken Lady," both of which have surpassed two million radio spins, taking each song to the next plateau of the "Million-Air" Award. "Except for God, my family, my friends, my fellow man and my country, my songs are the most important thing in the world to me. In truth, they are not really mine at all," says Gatlin. "They are gifts that I've shared with the world. The fact that radio stations would play the songs, that people would listen to the songs, buy records, and come to concerts to hear the songs, never ceases to amaze me and I am grateful more than I can say." The "Million-Air" Award has been bestowed upon many of BMI's iconic songwriters, including Sir Paul McCartney, Dolly Parton, Isaac Hayes and Roy Orbison. The acknowledgment is a mark of respect and praise. Gatlin has also received "Million-Air" Awards for "All The Gold in California," "I Just Wish You Were Someone I Love" and "The Lady Takes the Cowboy Everytime." "Houston (Means I'm One Day Closer to You)" and "Broken Lady" also received previous awards when the songs reached one million spins each. Larry Gatlin has a proven track record as one of the most successful songwriters in country music history. On the Top 10 list for male and female country artists with the most self-penned Top 40 hits, Gatlin comes in at #5, tying with Buck Owens at 34 songs. He also ranks at #5 on the Top 10 list for male and female artists with the most self-penned Top 20 hits (ties with Tom T. Hall at 28 songs). Gatlin wrote all 8 of the #1 hit songs recorded by Larry Gatlin & the Gatlin Brothers.